1. The LEGO brand has been around for decades and is one of the most beloved and recognizable brands by every generation all around the world. Respectively since its birth in the late ‘90s the LEGO® SERIOUS PLAY® methodology has established itself worldwide as an innovative, experimental process designed to enhance innovation and business performance. We are sure that the LEGO® SERIOUS PLAY® brand will inspire with confidence all my existing and future customers, and especially the ones who value quality, innovation and simplicity. 2. Serious / Wholesome and productive communication: we have noticed that the most effective trainings and coaching sessions take place when we use techniques and approaches that facilitate our customers to formulate and share the essence of their concerns. 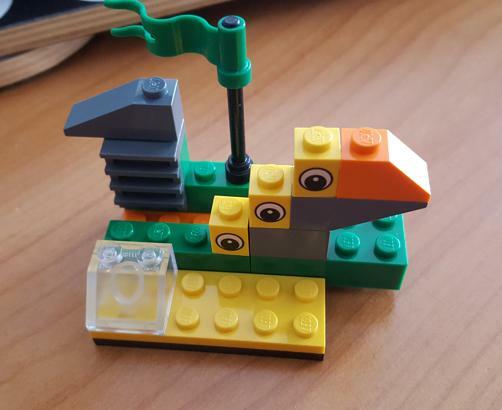 Тhe LEGO® SERIOUS PLAY® methodology applies visualization through objectification, e.g. the expression of something abstract in a concrete form. In its turn objectification opens the perspective for an invaluable “meta”-worldview.Reaching that state sequentially and naturally leads to a more constructive and wholesome understanding of the situation and the discovery of the obvious solution. 3. Play: if we would like to apprehend and perceive more effectively it seems to me play is the best approach. Playing while discussing serious topics does not belittle the topic, but rather takes any strain off the discussion process. The LEGO® SERIOUS PLAY® methodology allows to go beyond the “reasonable” considerations and to find creative and innovative solutions. When to use the Lego Serious Play Method? When the challenge is complex, and the organisation is ready for an approach that will allow for several different, but equally valid, answers to emerge before reaching one shared solution. creation and implementation of culture, team and leadership development. It is highly important that everyone participates in the discussions. You want to increase team understanding and the same time avoid frustration. You want to use time efficiently and avoid having anyone tune out. You would like to provoke new learning and new ways of thinking. You want to deal with tough and complex issues in a constructive atmosphere. It is highly important for members to be able to speak out their true feelings without intimidating anyone or being intimidated. You have a situation where a few members tend to dominate the discussions and you want to break that routine without offending anyone. It is highly important that the group finds an answer or solution they can fully commit to. Using this approach for thinking, communicating and problem solving will help generate a much higher level of engagement, participation and enjoyment.